The boy grew to become the man Samson and he was the most famous of the judges of Israel. He was blessed by the Lord with superhuman strength and killed entire armies single-handedly. "Then the Philistines went up and camped in Judah, and spread out in Lehi. The men of Judah said, 'Why have you come up against us?' And they said, 'We have come up to bind Samson in order to do to him as he did to us.' Then 3000 men of Judah went down to the cleft of the rock of Etam and said to Samson, 'Do you not know that the Philistines are rulers over us? What then is this that you have done to us?' And he said to them, 'As they did to me, so I have done to them.' They said to him, 'We have come down to bind you so that we may give you into the hands of the Philistines.' And Samson said to them, 'Swear to me that you will not kill me.' So they said to him, 'No, but we will bind you fast and give you into their hands; yet surely we will not kill you.' Then they bound him with two new ropes and brought him up from the rock. 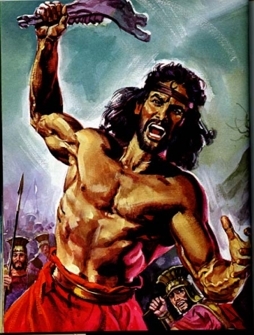 When he came to Lehi, the Philistines shouted as they met him. And the Spirit of the Lord came upon him mightily so that the ropes that were on his arms were as flax that is burned with fire, and his bonds dropped from his hands. He found a fresh jawbone of a donkey, so he reached out and took it and killed a thousand men with it. But after that, he met a woman named Delilah, and the Philistines used her to discover his weakness. After much prodding, he finally gave her the answer she was seeking.